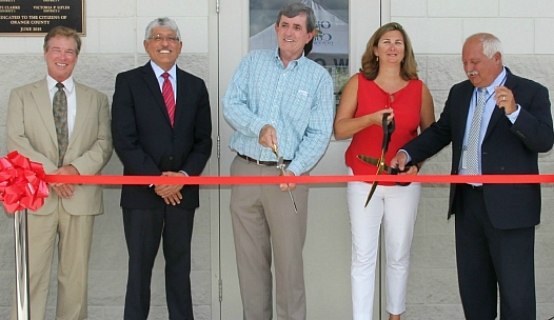 Orange County Government and its Public Works Division held a ribbon cutting ceremony for the new Young Pine Road Three-Points Maintenance Unit on July 21. The new location will provide better response times for issues involving pothole repairs and maintenance, tree trimming, grass mowing and sidewalk repairs for the citizens of Districts 3 and District 4 in Orange County. Orange County District 3 Commissioner Pete Clarke and District 4 Commissioner Jennifer Thompson attended the ceremony. A collection of photos from the Three-Points Maintenance Unit ribbon cutting is available for use by the media and located on Flickr.